With the recent Supreme Court Judgement that Fatwas are not legally binding, the question of a uniform civil code is again being debated. Recently, the Press Council of India Chairperson Justice Markandey Katju said in a write up and I quote- “I am fully in support of Uniform Civil Code” and “one of the reasons for the backwardness of Muslims is the lack of modernisation of their personal law”. As expected, the Muslim press as well the community leaders like All India Muslim Personal Law Board (AIMPLB) spokesperson Qasim Rasul Ilyas, All India Muslim Majlis-e-Mushawarat president Dr Zafarul Islam Khan, another AIMPLB member Kamal Farooqui and others severely criticised the observations of Justice Katju. In fact there was nothing new in the arguments of either of the two as it was simply a repetition of the sense in the debate of the Constituent Assembly. This debate is still continuing and would continue in the absence of a strong political will of successive ruling parties. Factually, the constitutional commitment for the enforcement of this Code was pushed into the back burner since early fifties of the last century by the first Congress party Government led by Jawaharlal Nehru and has continued till this day. The reasons for such an attitude were not far to seek. Many would call this as the politics of perverse secularism. A.K.Antony, the former Defence Minister may have beeen the first senior Congress leader who dared to speak honestly when he said, “Some sections of society have an impression that the party (Congress) is inclined to certain communities and organisations. Congress’ policy is equal justice to every one. But people have doubts whether that policy is being implemented or not”. Although, the party has distanced itself from this statement, those who are aware of the history of secular India have reasons to believe what the Congress leader said is true. Independent India inherited the legacy of violent partition on the grounds of religion and had at the same time accepted a sizeable chunk of Muslims as its minority. Aware of the pre-partition mental frame of the Muslims who opted to stay back in India, our national leaders with a view to put a check on the attitude of their communal cleavage and to assume national unity for a perfect social and political democracy – decided to discuss the issue of Uniform civil Code for the entire citizenry. Accordingly, as a first step in the direction of national unity which was not possible without social union, the Constituent Assembly held a long debate on November 23, 1948 in the Constitution Hall, New Delhi with Vice President Dr. H.C.Mukherjee in chair. The members of the Drafting Committee of the Constitution debated the motion on Article 35 of the Directive Principles of Draft Constitution which reads, “The State shall endeavour to secure for citizens a uniform civil code throughout the territory of India“. The motion was however, strongly contested by the Muslim representatives on the plea that interference in Muslim Personal Laws amounts to infringement of their fundamental rights guaranted in Constitution. One of them even argued that the motion is tyrannous to the minority. (Vide page 540 to 552 of Volume VII of Constituent Assembly Debate). The members who were in support of the motion convincingly rebutted the arguments of the Muslim members. The sense of the House was that the Shariat (Islamic laws) was negotiable not only during British rule but also during the first Sultanate of Allauddin Khilji in Delhi. Had Shariat been non-negotiable, how did the Indian Muslims accept the criminal laws enacted by the British? Shariat covers all the criminal and civil matters of Muslim society. But its erosion started in India when the Muslim rulers lost their power to East India Company which was subsequently transferred to the British Empire. Superseding the Shariat, the British Power codified the entire criminal laws under Indian Penal Code of 1860 and the Criminal Procedure Code. There was no opposition to this move of the British by the Muslims. Similarly, Muslims had no objection for Transfer of Properties Act or Indian Evidence Act. These non-Shariat Acts are still continuing even after the end of British rule. But there were no objections then. As far as Muslim Personal Laws are concerned, the British played its divisive politics and allowed all the communities to follow their customary family laws like marriage, divorce, inheritance and adoption. Muslims in several parts of India were also following the local customs of Hindus but British on persuasion of the Muslim leaders imposed restrictions on those Muslims who were following non-Islamic practices by enacting the Shariat Act in 1937. This was a calculated move of the colonial power to keep the Muslims and Hindus communally divided for its self-centric political gain. With Shariat Act, the British not only won the loyalty of a section of Muslims but also crystalised their movement for separatism which led to the partition of the subcontinent. Contrary to the British enactment of Shariat Act, another colonial power, the Portuguese successfully introduced Common Civil Code in the matters of marriage, inheritance and so on in Goa. Even today the Goa Civil Code, also known as Goa Family Law which is a set of civil laws governs the entire population including Muslims of this Indian State. “This attitude of mind perpetuated under the British rule, that personal law is part of religion, has been fostered by the British and by British courts. We must, therefore, outgrow it”. “Allauddin Khilji made several changes which went against the Shariat, though he was the first ruler to establish Muslim Sultanate here. The Kazi of Delhi objected to some of his reforms, and his reply was-I am an ignorant man and I am ruling this country in its best interests. I am sure, looking at my ignorance and my good intentions, the Almighty will forgive me, when he finds that I have not acted according to the Shariat. If Allauddin could not, much less can a modern government accept the proposition that religious rights cover personal law or several other matters which we have been unfortunately trained to consider as part of our religion. That is my submission.”. (Ibid. Page 548). After his long speech in favour of the Uniform Civil Code, the motion that “Article 35, stand part of the Constitution” was adopted and added to the Constitution as Article 44. Giving final shape to this Article, Dr. Ambedkar maintained that Directive Principles were binding for the functioning of the democracy. The sense of the argument was to achieve social democracy for a long lasting political democracy. “One of the factors that have kept India back from advancing to nationhood has been the existence of personal laws based on religion which keep the nation divided into watertight compartments in many aspects of life.”- Shiva Rao, The Framing of India’s Constitution: Select Documents II). “the provisions contained in this part (dealing with UCC) shall not be enforceable by any court but the principles therein laid down are nevertheless fundamental in the governance of the country and it shall be the duty of State to apply these Principles in making laws”. Some scholars view this Article in contrast to the Fundamental Rights of the Constitution which guarantees judicial enforcement and therefore gives a long rope to the State to keep its implementation pending for any period of time they desire as the Constitution did not specify any time limit for its enforcement. (Notes of M. R. Masani, Hansa Mehta and Rajkumari Amrit Kaur as cited in Framing of India’s Constitution, Editor B. Shiva Rao, VOL. 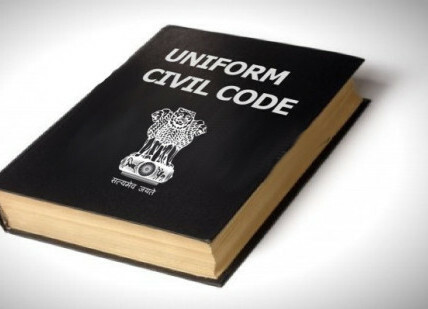 VII, Page 177 reads, “We are of the view that a Uniform Civil Code should be guaranteed to the Indian people within a period of five or ten years”) (http://blogs.timesofindia.indiatimes.com/satyam-bruyat/uniform-civil-code/). The question arises that despite being aware of the attitude of the minority community when our leaders in Constituent Assembly pushed through Article 44, why our successive ruling establishments didn’t enforce it? The answer lies in the above quoted statement of the Congress leader A. K. Antony. The delay tactics in enforcement of Uniform Civil Code is rooted to the debate on Hindu Code Bill in the floor of the Parliament in early fifties. Many members suggested that instead of a Bill exclusively for one religious community, a Uniform Civil Code should be enacted for the entire citizenry of the country. “Well, I should like a Civil Code which applies to every body but wisdom hinders. If the member or anybody else brings forward a Civil Code Bill, it will have my extreme sympathy. But I confess I do not think that at the present moment time is “ripe” in India for me to try to push it through. I want to prepare the ground for it”. (Uniform Civil Code and Gender justice by Dinanath Raina, page 1-2). This statement of Nehru was perhaps the first blunder which made the Uniform Civil Code the victim of perverse secularism and emboldened the perverted Communalists to ensure that this constitutional commitment is not enforced. Surely, he was aware that it was the strong political will of the leaders like K.M.Munshi and B.R.Ambedkar that Article 44 was pushed through. “The trend of thought among the various groups of Indian Muslims today, is the same as those before partition and they want to proceed almost on the same lines”. Nehru’s statement was not in conformity with the decision of the Constituent Assembly and therefore people gradually developed an impression that Antony referred to while addressing the leaders of Kerala Congress Committee. It is an unfortunate part of the post-British Indian history that even after over six decades of Independence, successive Governments and political parties have not yet prepared the ground to push this Code through. Ironically, even the disciples of Dr. B.R.Ambedkar became a part of the perverse secular brigade on this issue. It is a fact that the Muslim leaders will never agree for the enforcement of the Uniform Civil Code but the problem lies with the successive ruling establishments of the country that always give priority to the politics than governance. Due to lack of a strong political will, they failed to take any effective initiative to push this Code through. Even after the opposition to the Hindu Code Bill by many senior Congress leaders like Dr. Rajendra Prasad and Sardar Vallabhbhai Patel, it was passed as Nehru had a strong political will. Nehru and his supporters succeeded in the replacement of the traditional Hindu Personal Laws but ignored to have a Uniform Civil Code which was necessary for achieving the social unity and solidarity of the nation as envisaged by the very Preamble of the Constitution. Mention should be made that many Muslim scholars had also favoured reform in Muslim Personal Laws. Dr. Tahir Mahmood in his book, Muslim Personal Laws 1977 edition, made a powerful plea for framing Common Civil Code for all citizens of India and argued that many Muslim countries have outlawed polygamy. “suggested to the Government of India that the personal laws relating to the Muslim community may be examined by a special committee in the light of modern condition …. as done in case of Hindus (Uniform Civil Code and Gender Justice by Dina Nath Raina, page 13). Similarly, the women parliamentarians of 35 Islamic countries in a conference held in Islamabad, Pakistan in 1995 resolved to make “special efforts to abrogate discretionary laws as well cultural and customary practices” (Ibid. Page 19). Contrary to the war cry against the Supreme Court verdict in Shahbano case, Muslim delegates from Pakistan and Bangladesh in a workshop on Family Laws and Human Rights held in Lahore in August 1995 wholeheartedly praised and endorsed the verdict. The workshop was also in favour of reform and women delegates suggested that “all polygamous marriages shall be banned and made punishable”. The Muslim leaders who stayed back in India were fully aware that the Constituent Assembly adopted a motion in favour of Uniform Civil Code and therefore, they are constitutionally bound to support the common code for all the citizens of the country. The Supreme Court made repeated observations in Shahbano case in 1985, Sarala Mudgal case in 1995 and another case in 2003 saying it would forge national integration and remove dissimilarities. It may be tough to predict the future of this code but the time has come to revisit this important but long delayed issue now for the sake of national unity. One should not be surprised if there is an overwhelming support for a uniform code from the minority community and particularly from the women.